I didn’t think I’d learn so much myself when I started up Spiral Knights for Beginners, which is still in its infancy at 3 videos. But it takes several takes to show off any particular technique, as well as a lot of practice to make sure I can find the right mobs to demonstrate on. And with a particular idea in my head, I start to pay much more attention to it as I delve in the Clockworks. 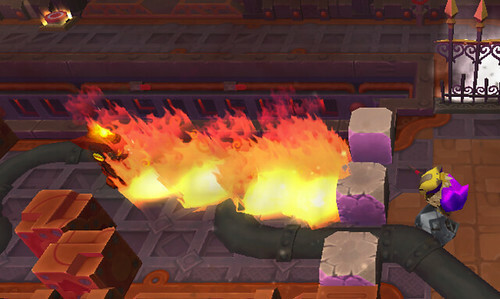 Oh yes, and five more flamethrower puppies appear in that narrow corridor as you progress down it. When I get to go down it again, I’ll make sure to take a screencast. A sword that deals out heavy normal damage (like Khorovod) makes exploring these kinds of surprise! rooms easier than special damage swords. The rooms were small enough that you didn’t have time to switch weapons before the Alpha Wolver broke your tiny little Plate Shield’s health. But the special damage swords can do far higher damage on their levels than the corresponding normal damage swords, given an enemy weak against the damage. We’re talking sometimes nearly twice that of a normal sword. My conclusion from this is that it’s not just convenient, but also rather smart, to carry around weapons that can deal all four types of damage. (Hm, we have four slots available….) It is helpful if you can find a dual-damage-type weapon, but you have to take into account that such a weapon will only do its full damage against an enemy weak against both types, and will be doubly weak against an enemy strong against both types. I think I wouldn’t have done well without Khorovod, because I neglected to take a Shadow damage sword along, and Khorovod’s excessive normal damage can almost always fit in the shoes of a special damage sword. And with shield canceling and sword canceling, charged attacks were far easier to pull off, even in confined spaces (and Khorovod’s charged attack is quite impressive, with the rocks that pop up behind me disrupting and even killing parts of the mob behind me). Someone once told me that charged attacks were useless because they took too long and you were vulnerable during that time; but for a lot of this run, charged attacks saved me. and of course, bombs are all charged attacks and quite deadly to the enemy. Khorovod is now level 10. No thanks to my partial Tier 2 run, since upper Tier 2 hands out less heat than lower Tier 1 (which does mean that, once I can solo lower Tier 2, heat will pick up immensely). I think next I’ll level up my Nightblade (before the Silent Nightblade, which will take quite a bit of work to level) and then my Voltech Alchemer (before the Mk II version). Then I’ll have a nice set of 2*/3* swords, bombs, gun, armor, helm, and shield that are all leveled. I’ll work next on creating a new set of 3* armor/helm/shield to level up fully, so that a Tier 2 run is not quite… so death-defying. And then I’ll start to level up my 4* items. When do you usually play? It’d be fun to take you through Jelly King or T3. Firestorm Castle maps are a cool change of pace if you haven’t been. I’ve never been further than Emberlight (hoping to change that after tomorrow’s patch release to fix some lagging issues, which might also help me in surviving the Jelly King), and just the name of Firestorm Castle fills me with dread, heh. I’m usually available during odd on-and-off evenings (PDT for now, just like the game server). About that corridor at the top of the post, i encountered a variant of that too. It had Rocket Puppies in place of Red Rovers. IT WAS A PAIN. A PAAAAAAAAAAAIIINNN.